Looking For An Indiana Flat Fee Broker? Your search is over! We are the largest Indiana Flat Fee Broker (aka Discount Broker) there is! We’ve been specializing in Flat Fee Listings for over 15 years and, so far, have saved our sellers over $6 million in commissions they otherwise would have had to pay out to Realtors! No longer do you have to choose between either selling FSBO (For Sale By Owner) with limited marketing or listing with a Full Service Realtor at an extremely high commission. List your FSBO on the same local Realtor MLS (Multiple Listing Service) directly with us (Indiana’s largest Discount Broker) and literally save THOUSANDS while getting all the same marketing Full Service Realtors offer. The Flat Fee MLS listing is perfect for the homeowner looking to sell their home fast while saving thousands compared to listing “Full Service” at 6-7% with a typical Realtor. It gives your home all the same exposure other agents can give, including being listed on your local MLS, Zillow, Trulia, Realtor.com, and literally hundreds of other sites. We also offer a 1% full-service upgrade for those who aren’t up to the challenge of managing the transaction themselves. If you also need to purchase a home, we offer up to a 1% Buyer Rebate out of of our commission for buyers who use us to find their next home. On a $300,000 home, that’s up to $3,000 back in your pocket at closing! We cover 81 counties in Indiana, including the following: Adams, Allen, Bartholomew, Bedford, Benton, Blackford, Boone, Brown, Carroll, Cass, Clark, Clay, Clinton, Crawford, Delaware, Daviess, Decatur, De Kalb, Dubois, Elkhart, Floyd, Fountain, Fulton, Gibson, Grant, Greene, Hamilton, Hancock, Harrison, Hendricks, Henry, Howard, Huntington, Jasper, Jay, Johnson, Knox, Kosciusko, Lagrange, Lake, LaPorte, Lawrence, Madison, Marion, Marshall, Martin, Miami, Monroe, Montgomery, Morgan, Newton, Noble, Orange, Owen, Parke, Perry, Pike, Porter, Posey, Pulaski, Putnam, Randolph, Scott, Shelby, Spencer, St. Joseph, Starke, Steuben, Sullivan, Tippecanoe, Tipton, Vanderburgh, Vermillion, Vigo, Wabash, Warren, Warrick, Washington, Wells, White, and Whitley. We are company that operates according to Christian principles, so you can expect to be treated with honesty, integrity and fairness throughout the entire selling/buying experience. To find out more about how we can help you sell or buy a home while saving or giving you thousands, browse our site or call us anytime at 574-626-8432. If you’re ready to purchase your Indiana Flat Fee MLS Listing, go ahead and click the “Shop” button above and get started. The process is easy and you can rest assured that you’re dealing directly with the largest Indiana Flat Fee Broker, and NOT some middleman Internet site. We’ve made the process super easy! Just click the button to the right, add to cart, and complete your order. Then, you’ll receive an order confirmation with a link to your listing forms. Once we receive everything back, you’ll be listed in your local MLS within 1-2 business days! Great experience! Paradigm saved us thousands and we actually received more showings than when it was listed with a standard Realtor. Would highly recommend to anyone interested in saving money by just doing a little extra work. Sublime HomesSaved $50,841 so far!!! I couldn't have been happier with Josh Vida's service!! Being a homebuilder and enjoying selling my own houses myself anyway (thru sunday open houses), this service is a no-brainer for me. I only paid 2.5 % to the selling realtor and josh's very low fees, saving more than 3% over the 6% I used to pay for a standard MLS listing. It only took 2 weeks from accepted offer to closing and i saved around 15,000 !! Josh's service will help transform the industry thru more reasonable(and more negotiable) listing fees. Thank you Josh !! Derk Brewer (Bloomington, IN)Saved $22,080!!! This is the best decision I've ever made. I saved over $20,000 in listing agent fees. Josh and his team were very efficient and easy to work with. Our house sold within 24 hours of listing!!!!! Phillip Lewis (Westfield, IN)Saved $21,000!!! What is there NOT to love about saving $14,000 in realtor fees?!!! The flat rate process was so easy and Josh was a great facilitator along the way. Josh was so prompt on answering any questions that came up. Carol Albertson (Scottsburg, IN)Saved $13,500!!! 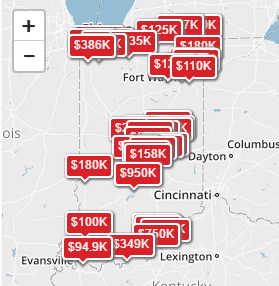 This is likely the best flat fee listing service in Indiana. Joshua is very honest and responsive and we loved working with him. The whole process was smooth and he was very helpful answering questions and guiding all along the way. Thank you! Kumar D (Bloomington, IN)Saved $11,070!!! Our experience with Josh and Paradigm Realty was excellent. Josh was very responsive to questions which is the key to feeling comfortable. We would highly recommend Josh for anyone looking to sell their home using the MLS listing, as that is so important to get the visibility. Jeff Platzer (Ft Wayne, IN)Saved $10,080!!! This is the only method of selling a home that I will ever use again. Joshua Vida is a broker that can list homes on the MLS. For a flat fee of 399 (for six months) he will put your house on MLS, but you have to do some of the legwork. You are responsible for providing the photos, writing up a description, etc. and then he posts it live. You can make changes to your listing whenever and adjust price whenever and he'll update it within a day or so. We only paid a 2.5% commission to the buyer's agent and had TONS of showings - which convinces me that the traditional model is broken. Using Joshua's services, we saved more than 10,000 in commission! James Burnes (Indianapolis, IN)Saved $10,347!!! Josh did an outstanding job and quick turnaround and prompt responses when I had questions. He went above and beyond to assist and support the sale of my home and is very professional. He makes you feel cared for as a client and is very skilled at his work and detail oriented. He is your advocate and does great follow thru to sail to a smooth closing. Thank you Josh! I look forward to sending you referrals and doing business again in the future! Katy Kays (West Lafayette, IN)Saved $11,331!!! Working with Josh was an absolute pleasure. He performed all updates promptly and accurately and made himself available to answer any questions throughout the process. He showed himself to be a person of high integrity during a particularly difficult negotiation with the Buyer's Broker. Although I had not hired him to handle any portion of the negotiation, upon discovering that the Buyer's Broker had misrepresented information, imposed unrealistic deadlines and had resorted to bullying tactics, he stepped up to protect me and saved the deal. Josh is honorable. He cares for his clients and knows how to fight for them while still maintaining his professionalism. I give him a five star review and recommend him highly. Cynthia King (Bristol, IN)Saved $10,290!!! I have to admit that if I ever have to sell a house again. My first call would be to Joshua. He not only made the process easy, but it was simple to follow. My house sold the first day. I will be spoiling the granddaughters with some of the thousands extra in my pocket. With Josh Vida & Paradigm Realty Solutions, we sold our house in less than a week during a recession. Thanks to their Flat Fee service, we literally saved $3,866 in the sale of our house. We definitely recommend this service, and are certain that many other families will literally save thousands of dollars as well. Thank you Paradigm! Robert Booras (Porter, IN)Saved $4,164!! Thank you for your help during this entire transaction of selling our house. I'd definitely go the for sale by owner route again if we do sell another house in the future. Jeremy Wolfe (Columbia City, IN)Saved $4,197! The services provided by Paradigm were a perfect fit. My house sold quickly, at a fair price, saving me and the buyer money on the commission. The savings were $5700 on this single transaction. I couldn't be happier with the outcome. The next time I'm buying or selling a property, I'll be giving Josh a call. Randall Hubbell (Shelbyville, IN)Saved $5,700!! Joshua was very helpful in setting up our house on the MLS listing guided us in what we needed to do to sell our house. I definitely would recommend him to anyone who is wanting to sell their house. Renee Gabet (Huntertown, IN)Saved $4,317!! Josh was very helpful to us during this whole process. We listed the home with Josh after trying with a realtor for 7 months and a FSBO for 3 months, then finally decided to try the Flat Fee Service. Glad we did. We sold our home after a couple months on the market using the Flat Fee Service. Saved us a lot of money. Would recommend Josh and the Flat Fee Service to anyone. Dianne Rombke (Elkhart, IN)Saved $5,985!! Thank you for all the work you have done helping to get this house sold. I appreciate the prompt communication and helpful advice you and your team have given during the listing period. I especially appreciate the way you quickly forwarded all messages from prospective buyers to me and quickly made any changes needed to the listing. You have given us great service and I would look forward to using your company again on future listings. William Wallen (Crown Point, IN)Saved $5,907!! Josh's company turned what could have been a breakeven or worse sale into a pleasant surprise at closing. Within 1 day of listing, we had 4 showings scheduled and sold our house the same week at 98% asking price. Josh was very helpful with creating the listing and communicating our responses. Thanks for your help! Dan Goode (Indianapolis, IN)Saved $3,960! Thanks again, you have been very helpful. Customer service is what counts and you guys are a pleasure to work with!!! Keri Karris (Plymouth, IN)Saved $10,194!!! Thanks for your help on this. It has gone very smoothly. I know the only reason it didn't sell faster was the price I started from. Nothing to do with your service. Chris Reed (Noblesville, IN)Saved $7,647!!! Our experience with Paradigm Realty was a great one. All of our questions were answered quickly and Joshua was very helpful Throughout the selling of our home. We would highly recommend this company. Jerry & Lee Murray (Fishers, IN)Saved $7,470!!! Josh was great at providing the service we selected and we had a very successful outcome! Angie and Glenn (Fremont, IN)Saved $7,797!!! Our experience with Josh Vida and Paradigm Realty was a good one. I appreciate how quickly Josh responded to any question or need we had. We sold our house in less than 3 weeks and we were very happy with the process. RoseMarie Bolinder (Fishers, IN)Saved $8,997!!! Thanks again for all you did to make our for sale by owner experience as pleasant of an experience as you did. We enjoyed your interaction and personal touch to what is usually a very impersonal experience for most people. We will recommend you whenever we get a chance! Ken & Linda Calhoon (Valparaiso, IN)Saved $8,848!!! I just want to thank you for all the hard work you put in for us to finally arrive at this day. You were very professional throughout the process and a pleasure to work with. I will definitely highly recommend you to anyone I know that's selling their house. After having our house on the market for 6 months last year without receiving a single offer, I couldn't believe we received what turned out to be our buyers offer within the first 10 days of listing with you. Josh Wesner (Indianapolis, IN)Saved $3,090!! Jana Wagner (Indianapolis, IN)Saved $7,860!!! The experience was very easy. We decided to take advantage of the 1% full Broker service and are glad we did. We saved about $3,300 dollars. Donald & Barbara Hyatt (Lafayette, IN)Saved $3,458! Everyone needs to strongly consider this option when selling a home. I saved $11k. You need to do some work taking pictures and writing a description for the home up front and learning how to close the transaction at the end, but it's well worth that kind of money. Andy David (Butler, IN)Saved $11,000!!! You have been great, and I will be looking at your listing service in the future when we sell again. Tom Beachy (Fort Wayne, IN)Saved $3,327! We had a very positive experience listing our house with Paradigm Realty Solutions. It got us exposure on several web sites as well as in the multi-list. We were able to sell our home in 3 weeks and saved thousands of dollars. Thank you again Joshua. Charlene Salpietra (Newburgh, IN)Saved $7,179!!! I was extremely pleased with the guidance from Josh as he helped walk us through everything and shared his recommendations with us as a real estate professional. Going forward, if we ever need to sell our home again, I will call Josh and have him walk me through everything that is needed. We saved over $ 7,000.00 dollars on our last home through Josh's service. I'm a believer and would always recommend Josh and Paradigm Realty for all of your buying and or selling needs. It makes great sense and saves you lots of money! Greg & Nancy Glanders (Elkhart, IN)Saved $4,878!! I was not interested in paying a realtor a 6% commission to sell my house, but have to admit that I was a little nervous going the flat fee listing route. However, Josh was very responsive and provided excellent advice throughout the process. The listing became active on the MLS on September 3rd and we closed on November 30th! I would highly recommend Josh and his team. You won't be disappointed! Jaime Lopez (Indianapolis, IN)Saved $1,798! Very positive experience. Saved about $6000.00 and I received advise as well as assistance with forms. Elmer Johnson (Woodburn, IN)Saved $8,970!!! Josh was great. He saved me over $3000 and even stepped in to handle issues going on with the other agent. He went above and beyond the call for me. As soon as I listed with him I started receiving calls for showings. I will always go fsbo from now on and have Josh handle my listing. He offers numerous options so you can choose how much you want to handle yourself and when you want him to handle things for you. Matt Stutsman (Granger, IN)Saved $4,020!! We started out our selling process as a for sale by owner but soon found out that as interest began to build that it was difficult to keep up. The property was located 2 hours from where we lived so that added to the challenge. Paradigm stepped in for us and acted as both selling and buying agent which greatly simplified the process. In addition, they took care of scheduling all of the various inspections and appraisal. Josh and his office staff were pleasant, efficient and communicated well. The flat fee was much less than the traditional percentage based fee the realty industry has used for so long. We would certainly recommend Paradigm Realty. Randy & Mary Ann Tatlock (Clinton, IN)Saved $8,500!!! Very pleased with my Paradigm experience. The process was easy, Josh & his team were responsive, throughout, and we sold our home in less than 30 days of our listing date. Would definitely use Paradigm, again, in a heartbeat. Thanks! Dustin Brown (Indianapolis, IN)Saved $7,050!!! Joshua and his staff provided a great service that saved us thousands. I recommend this great service to everyone trying selling their house FSBO. No surprises the price quoted was the price we paid. Tom Drexler (Jeffersonville, IN)Saved $5,487!! I probably saved around $5,500 using Paradgim. Josh takes all of the guess work out of it. Very positive experience. Will use Josh in the future. Albert Skinner (Columbus, IN)Saved $5,547!! Paradigm Realty was our listing agent through ***********.com and they were great, I wish I could say the same for ***********.com, but that is another review. Josh and his staff are very responsive. He exceeded my expectations. One of the best parts about dealing with Josh is how quickly he responds to your questions. If I were to sell again I would most definitely use Paradigm Realty. Dennis & Darlene Errichiello (Porter, IN)Saved $7,500!! Josh and Paradigm Realty did an outstanding job, I would highly recommend him. Saved us thousands of dollars and the process was smooth. I would also recommend taking him up on his full service offer. For a small fee, he handles all the paperwork and walks you through the entire process. Chris Shegich (Schererville, IN)Saved $4,860! This was great and easy process. The system Joshua has set up is easily understood and straight to the point making for an excellent experience. I highly suggest this company/Joshua. Donald Sorrells (Bedford, IN)Saved $4,497! Joshua guided and advised me through the process of getting my property on multiple listings, doing negotiations with the buyer through his relator, meeting legal requirements and meeting the requirements of the buyer getting an FHA loan. For only a 1% fee, he saved me several thousand dollars and enabled me to get a good price for my property. All this he did via email and phone. It was both convenient and productive. Easy, Easy, Easy. We would definitely use Paradigm again! Josh is there when you need him. He made every accommodation we needed promptly. This is the best FSBO site out there! Cynthia Cavitt (Elkhart, IN)Saved $8,250!!! Karen McKay (Noblesville, IN)Saved $5,865!! Our experience was great! We saved over 8,000 and will never use a realtor again. I had zero knowledge on selling a home but Josh at Paradigm answered all my questions and gave advice on things to help along the way. I would highly recommend this service to anyone looking to sell! Sara Carrell (Crown Point, IN)Saved $8,390!! We listed our home and Joshua Vida was assigned to us as our realtor. He kept us very informed of how the process should work once we sold our home & walked us through the process. I would highly recommend Joshua. Douglas Lankford (Roanoke, IN)Saved $5,097! Thank you. The MLS works. Our house sold at the asking price for cash within one week. Wayne Madden (Auburn, IN)Saved $5,655!! After researching flat fee listing, I was cautious about the process but knew that I wanted to try something that was going to save some money, and that was better than FSBO. After shopping for a flat fee service, when I spoke to Josh I knew that Paradigm was the very best option. His contract is straightforward, simple, no hidden fees - and is the best option for any seller in my opinion. He is easy to work with, and seems to genuinely want the best for his clients. We sold our house within 2 days, closed in less than a month, and saved over $5000! I will be recommending Paradigm to all my friends and family! Gail Passo (Westfield, IN)Saved $6,447!! I highly recommend Josh Vida/Paradigm Realty Solutions. He made the home selling process quick, thorough but seamless. I had a great experience and will definitely recommend and use Josh/Paradigm Realty in the future. Shannon Walker (Crawfordsville, IN)Saved $6,300! We worked with Josh on a flat fee listing . The experience was great and he was very easy to work with. The fee saved us a lot of money and after listing our house on the MLS, we sold within 3 days. I would definitely recommend using Paradigm Realty's flat fee listing. Craig Stace (Ft Wayne, IN)Saved $8,697!!! This is the second time that I have used Paradigm Realty Solutions. Saving a lot of money on the listing side is obviously a plus but what I like most is to control the phone calls directly with the Realtors and showing feedback. Their website is solid and they communicate quickly I will definitely keep using them. Steve Dicken (Syracuse, IN)Saved $4,047!! My name is Joshua Vida and I'm the Broker/Owner of Paradigm Realty Solutions. I've been in Real Estate for more than 15 years. I'm a man who runs both his personal life and business according to Christian principles. I believe, for many, paying 6% to Realtors can be too much, which is why I decided to do what I do. If you have any questions, I'd love to talk with you! Give me a call. Paradigm Realty Solutions © 2019. All Rights Reserved.